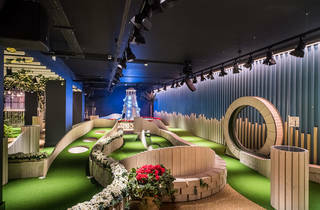 When Swingers opened in the City in 2016, it was pretty much a hole in one: 16,000 square feet of 1920s-themed crazy golf in an office block next to the Gherkin. 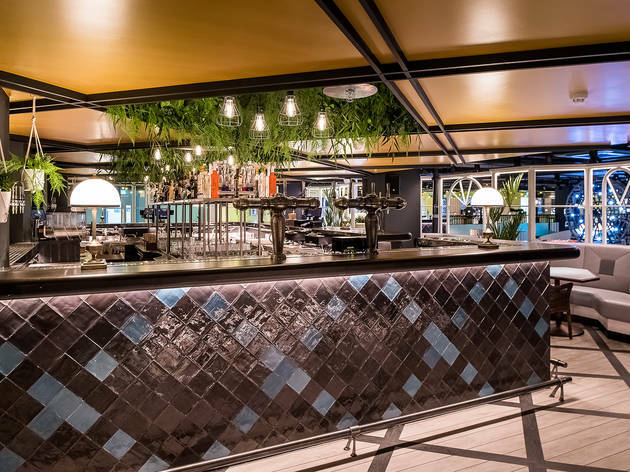 Now that site in Suitsville is getting an even bigger, more outlandish sibling in the former BHS flagship store on Oxford Street. 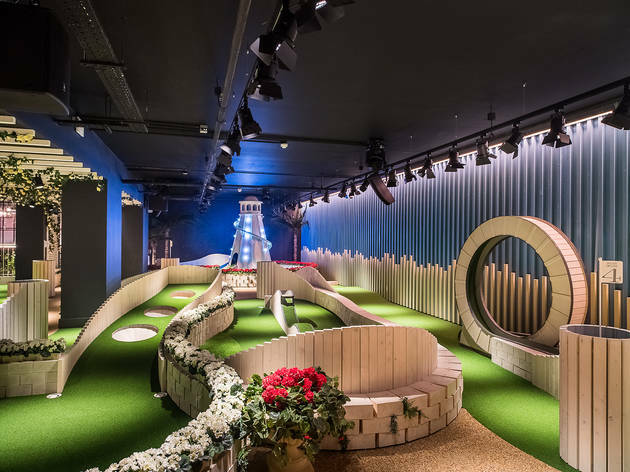 An ode to the English Riviera, the Swingers West End course includes a helter-skelter and big wheel, with beach huts and bandstands – plus lush palms for added ‘Miami Vice’ vibes. Think of your best childhood seaside holiday, then add booze. Lubrication will be provided on-course in the form of cocktails delivered by roving caddies, and you’ll be able to refuel between rounds with street food by Made of Dough, Patty & Bun and Hackney Gelato. Striped blazers and straw boaters at the ready, old sport – we’ll see you on the first tee. 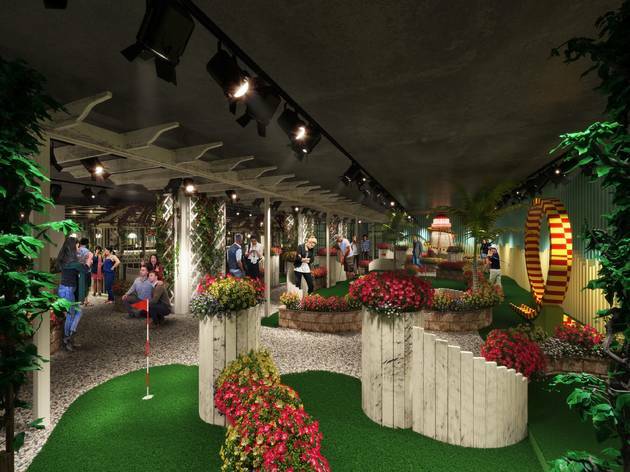 RECOMMENDED: The best crazy golf in London. 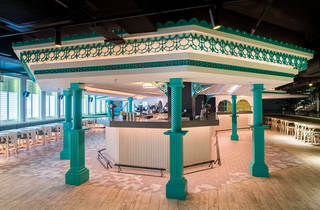 Please note: Swingers is an over 18 years old venue & guests will need to provide valid photo ID. Swingers definitely like to play on their pun... the bar is made up of innuendos for cocktail names and the food menu follows suit. They food menu caters for all with a variety of stalls inside the complex. I loved my vegan pizza from 'Made of Dough' with creamy vegan cheese and mushrooms... what could be better! The mini golf course isn't the best. The course's are your stock standard and sadly the decor isn't up to scratch. It just felt a tad boring and same old crazy golf course. I think there are better courses out there to go to. 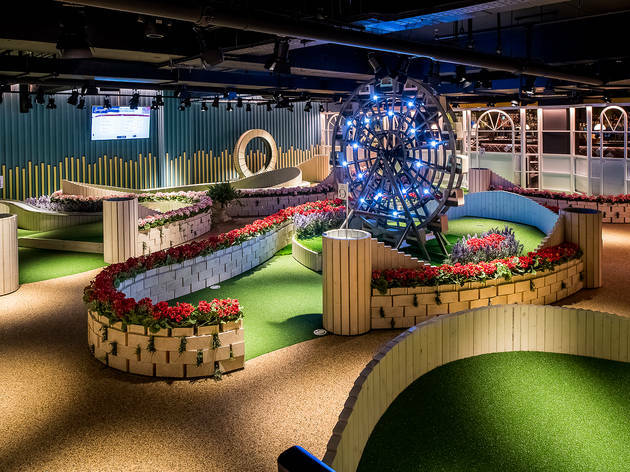 It’s one of those places where team buildings usually take place and if you are good at mini golf, you will probably enjoy it. The highlight of my evening was the food however, I liked the fact different companies have their food stalls there, so you avoid basic pub food- instead, you can get a burger from Patty and Bun! I tried Swingers in Aldgate about 2 years ago with a friend and really loved the whole experience. 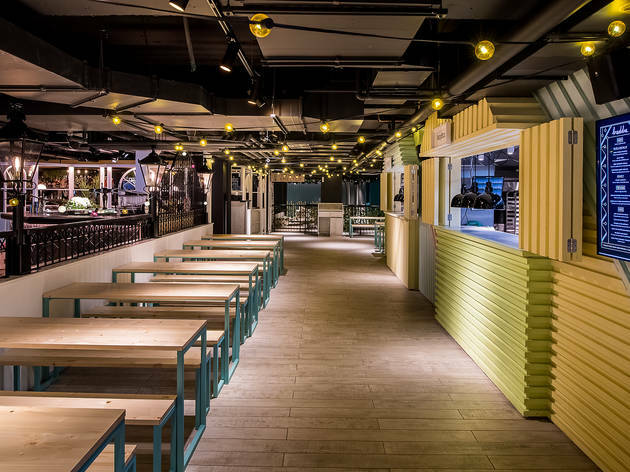 I liked how they had food stalls and bars so you could make it into a full activity with a meal and drinks. It was also my first time playing minigolf in London, so quite a memorable and lovely time! 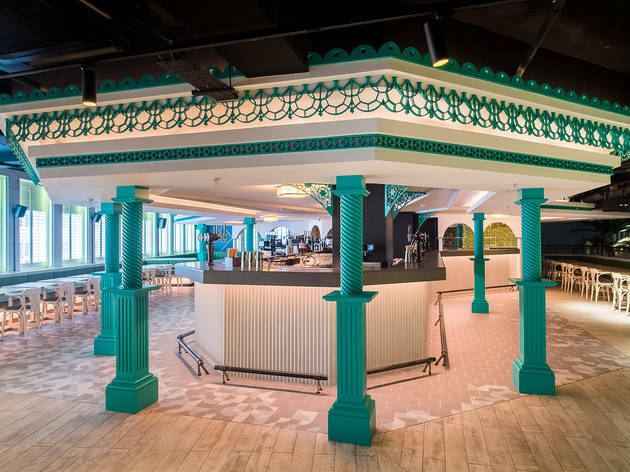 So when I found out they were opening another Swingers in central London, I was thrilled! My friends and I tried this course a few weeks ago and had a blast! We came on a Sunday without a reservation and only had to wait about 30 minutes until we got to play, which was the perfect amount of time to grab a drink (in a plastic cup if you plan on bringing it on the course with you!). 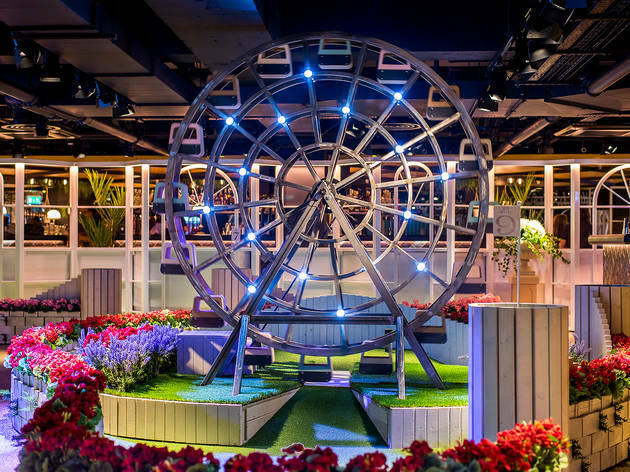 It was a simple and exciting 9-hole course with a brilliant last hole with a ferris wheel that you have to get your ball through to finish. We had loads of fun and I even got a free shot when I made a hole-in-one and one of the staff saw! I think that's such a great perk/reward to have, when the staff are enjoying themselves and cheering the customers on. Sadly, we didn't have the chance to try the food stalls at the West End branch but definitely next time! This place is very cool and so much fun! 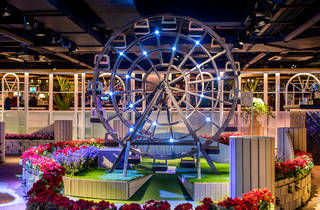 It’s brand new, in the building that was once the BHS store, on Oxford Street, which has been completely transformed. 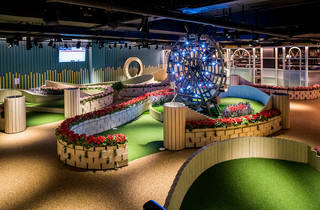 There’s crazy golf, street food and cocktail bars- making it an awesome venue for a sociable night out. The golf courses are fun and totally instagrammable in the floral, sunny, English Riviera setting. Highly recommended for a birthday party, team build, or just an awesome night out with friends- best experienced in a group, the more the merrier!